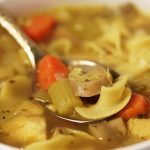 Chicken Soup Instant Pot Recipe - Are you craving a hearty bowl of soup but don’t have all day to spend all day in the kitchen? Instant Pot Chicken Soup is done in a snap. It’s easily made and so delicious. Chicken Soup is a classic, comforting meal that your whole family will enjoy. Easy slow cooked flavor in just 30 minutes, this Instant Pot Chicken Soup is done in a flash! While the bacon is frying, prepare the vegetables. Peel and dice the onion and carrots. Clean the Brussels sprouts, quarter the Brussels sprouts. Dice the celery and red pepper. Slice the mushrooms and green onions. Add the chopped vegetables to the Instant Pot along with the bacon. Onions, carrots, celery, mushrooms, red pepper and Brussels sprouts. Add the black and red pepper. Sauté for 3 minutes. After 3 minutes, add the garlic and sauté for another 30 seconds. Add all the remaining ingredients. Stir well and seal. Change setting to manual and time to three minutes. After the timer is done, do a quick release. After the steam is released remove the lid. Add the frozen peas (no need to unthaw, the heat from the stew will quickly cook them. Add the minced parsley, sliced green onions and fresh lemon juice.